IDF aid delegation locates bus trapped by flood after dam collapse, no survivors on board. Yesterday, during late night hours, the IDF aid delegation landed in Brazil. The delegation was welcomed by local Brazilian forces and authorities. The delegation commenced its activities in the field in the areas that have been identified as areas with potential to locate trapped and missing people. The area of the collapsed dam has been defined as dangerous, requiring the delegation to conduct additional mapping of the area in order to ensure a safe operating environment. 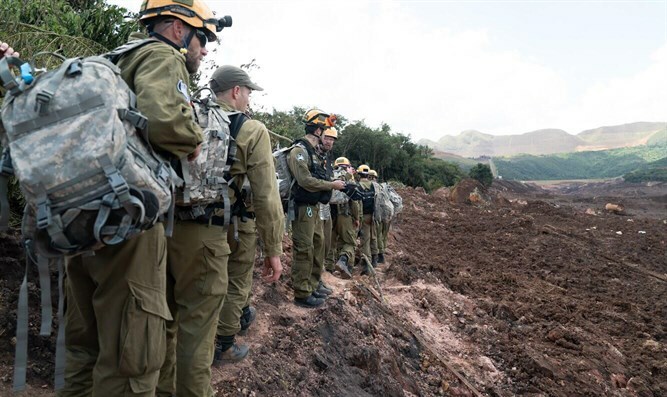 IDF troops in the field are employing various rescue techniques while utilizing all of the existing capabilities and technologies of the rescue array in the Home Front Command. Amongst others, cellular location devices, the construction of structures meant for work in water and additional search and rescue techniques. The Israeli delegation is operating in full cooperation with local Brazilian forces in order to evacuate a number of corpses that have been located in a bus that was captured in the flood. Earlier today, the Israeli forces detected and evacuated a number of corpses in the field.